Similar to Kaiserslautern, cult club and national favorites St. Pauli share a similar goal, to avoid relegation. St. Pauli’s greatest deficiency has been their failure to score goals. With the worst offense in the league, the Hamburg based club had to scramble for goals so far. No club has scored fewer goals than St. Pauli (16). Their poor home form has matched their dreadful attack. They have won only two matches in front of their loyal fan base this season, disappointing considering it was supposed to be their saving grace after promotion. St. Pauli are the league’s financial minnows so they were always going to have to be frugal and astute to stay in the league and compete. Manager Holger Stanislawski has put his faith in youngsters like Sukuta-Pasu, Naki, Bartels, Kruse, Zambrano and Oczipka. Unfortunately Sukuta-Pasu suffered an injury early on and Naki has been either injured or dealing with disciplinary issues. Both were vital in St. Pauli’s promotion though and their absence has been a big reason for the team’s lack of firepower. Stanislawski’s men started out quite well, winning 4 of their first 8 games and hovering right around 6th place but their form dipped tremendously towards the end of October, losing 7 of their 9 remaining games. It seemed as if St. Pauli suddenly wore out their welcome in the Bundesliga but the truth is that they had to deal with injuries to key players which destabilized the team as a whole and vulnerable to in form teams at that time. They have since failed to recover and won only once in their last 9 games. Best performer: Slim pickings in this category. No player has really stood out. Peruvian defender Carlos Zambrano, on loan from Schalke, has done well considering his age and the team’s relative weakness while midfielder Matthias Lehmann has performed admirably amidst the ever-changing lineups. Recent acquisition Gerald Asamoah has been St. Pauli’s most productive player statistically but even he has struggled without the right support. Deniz Naki, all the talent but does he have the mental discipline? Biggest disappointment:Deniz Naki. Naki was part of Germany’s European Championship winning team two years ago at the U-20 level. That team included players that have all made the leap to first team football like the Bender brothers at Dortmund and Leverkusen, Reinartz at Leverkusen, Toprak at Freiburg, Risse at Mainz and Gebhart at Stuttgart. Two of Naki’s team mates were also in that squad, Sukuta Pasu and Oczipka, both of whom have come along quite well. A cloud of uncertainty has always hovered above Naki due to his disciplinary record. He has the talent but almost everything else has been an issue of contention, showing up late to training, skipping it altogether and not sticking to the team ethos of collective unity. Stanislawski has not been shy in his criticism of the player. Naki stands at the proverbial crossroads, reform and reach his potential or continue down the current path and regress into obscurity. St. Pauli’s fate may just depend on it. Question – Can St. Pauli stay in the Bundesliga? Odd makes will tell you that they are going down although that might not necessarily be the case. If St. Pauli starts the way they finished they will undoubtedly create a situation for themselves that will prove too difficult to overturn. They will have to improve their home record and most importantly put the ball in the back of the net. St. Pauli have created the least amount of goal scoring chances in the league and with the 5th weakest defense in the league they cannot afford to continue their dry spell, let alone squander the few chances they do create. Stanislawski’s work and focus on youth is a sound long-term strategy but he will very much be dependent on their progression from here on out. Köln's famous and always reliable supporters. 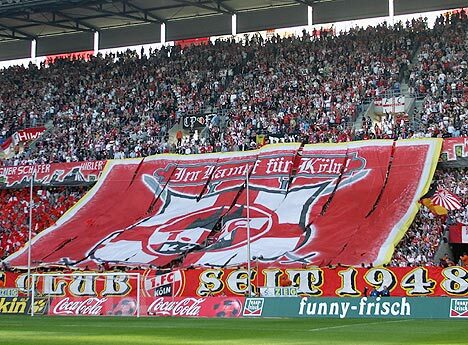 Köln are one of the best-supported clubs in the league and regularly sell out stadiums. They have done so even recently when the club turned from a league regular to a proverbial yo yo club, bouncing up and down the top two tiers of German football. Prodigal son, Lukas Podolski, recently returned to the club but not even that sufficed in turning the fortunes of the club around and yet again they find themselves battling relegation from the beginning. Similar to St. Pauli, Köln have found it difficult to score goals and have an awful record on the road. They have scored a measly 18 goals and collected 4 of their 15 points away from home. The only two teams with fewer points than Köln have scored more than them and with an international star like Podolski more is expected of their. Köln have scored more than two goals on only three occasions this season and ended up losing all three times. With only 4 points collected, Köln’s away form has been abysmal to say the least. You know your season is not going according to plan if your biggest loss is at home to the worst team in the league. Another problem has been Köln’s inability to find a consistent lineup/formation, whether under coach Zvonimir Soldo or Frank Schaefer, who replaced him in September. Podolski’s best position has been debated since his first stint at the club. Is he better in a supporting role or as the lone striker? Early in his career he lead the line quite well but that was against 2. Bundesliga opposition. Recently he has been deployed in a more supporting role, either on the left or behind the striker. Koln have opted between a 4-2-3-1 and 4-4-2 this season, both different systems entirely and perhaps a bit too much to ask of Podolski, who has never been the most tactically disciplined player. Geromel, one of the league's outstanding central defenders. Best performer:Pedro Geromel. Once again the Brazilian defender manages to stick out in a team filled with underachieving players, remarkable considering the circumstances. Even more remarkable given that Geromel operates in defense, which in Köln’s situation is most active part of the pitch on a weekly basis. Martin Lanig has also stood out as much as a player could given the difficult circumstances but Geromel has proven once again that he has the necessary quality to take that big next step. Biggest disappointment: Although half of Köln’s goals were scored by their two primary strikers they offense has to be the biggest disappointment this far into the campaign. Novakovic and Podolski were touted to be one of the better striking partnerships in the league but neither have managed to build any kind of consistency. In fact, stories circulated about an earlier fall out between Soldo and Novakovic and any off field drama affects on field performance while Podolski is notorious for being difficult. Suffice to say, that kind of drama is the last thing Köln need in a relegation fight but the tactical inconsistency and failure to find the net regularly are the biggest reason for their poor Hinrunde. 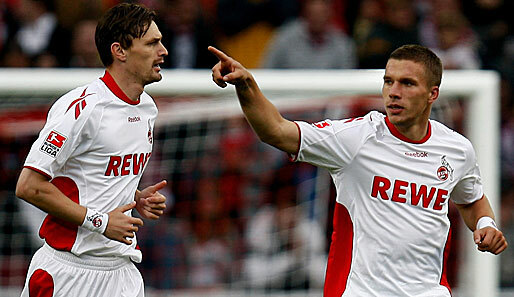 It's been a difficult season for both Novakovic (l) and Podolski (r). Question – Is Köln doomed for the drop?Köln avoided the drop last season but nothing so far has hinted at the possibility for improvement. They have not changed collectively from last season and it can be argued that the team regressed since last year. The Billy Goats have spent all but four weeks in the relegation zone and are set for the drop unless they can drastically improve their goal output. Relegation would be damaging for Köln for several other reasons besides the obvious. Players like Podolski and Geromel will inevitably leave for greener pastures and the team will have to rebuild from the ground up. Perhaps that is the inevitable path for a team that has looked doomed for the drop since the start. If Schaefer does manage to get his strikers to work well together and the rest of the team to support them they have what it takes to survive again but so far it is an unrealistic prognosis.